To protect the Enns valley from those pesky, marauding invaders, who ravaged landscapes and decimated villages, a castle was built on this strategic spot. The name Püchlarn was first documented in 1074 when priests from a neighboring village laid the original foundation. 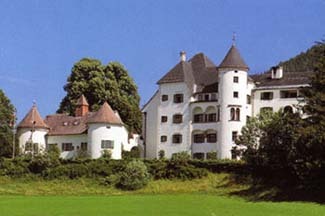 Over the centuries the castle was added to, torn down in sections, and rebuilt again. Amazingly, the castle still maintains much of the architectural integrity of its medieval origins. Although Pichlarn doesn’t present itself as much as a “castle” as some other Austrian castle hotels, I include it because the hotel’s mountain backdrop is nothing short of spectacular. The drive through the Enns valley is equally gorgeous, as well. For those of you who want 5-star resort accommodations with lots of activities to do and a romantic ambience, Pichlarn is a great choice. Irdning is about 110 km. southeast of Salzburg. The hotel will pick you up if you’re arriving by train. The nearest station is at Stainach, where there are connections to Salzburg. Sometimes a charming, intimate family-run castle isn’t quite what a visitor is looking for on the next vacation. A resort destination in itself, Schloss Pichlarn offers a full range of facilities and activities. Here you can choose to spend the entire time within the resort grounds or spend some days exploring the stunningly beautiful region. Schloss Pichlarn is a modern hotel—rooms underwent redecoration in 2005 and the hotel even offers wireless for those who can’t part with their laptop—but in an authentic medieval structure, of course. An enormous selection of sports activities in a gorgeous valley setting.